This tutorial will be a little bit different than usual 'cause I will also show you my tests and my failures. 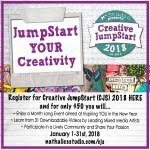 I know some of you out there would love to start art journaling or painting or 'something' creative, but get discouraged seeing all the 'good stuff' made by well known artists. Well, let me tell you something: these artists make mistakes too, they just don't show their attempt and failures on their websites. I usually don't show those either... my blog posts would get rather long and it's always nicer to show the finished results. But hey, I do spend a lot of time on testing and trying without (satisfying) results. And I also get frustrated sometimes when it comes to creating art. I try and fail. And once in a while I try and succeed. 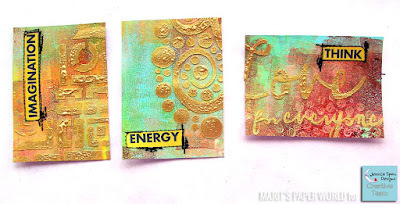 So today I'm going to show you my process of creating ATCs, including the tests and attempts that I put aside as 'not to my satisfaction'. Ready? 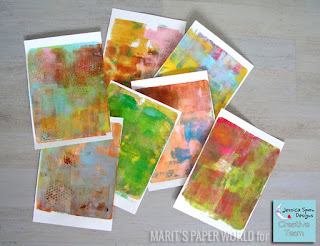 First, I take out some gelli-printed background papers that I have in stock. 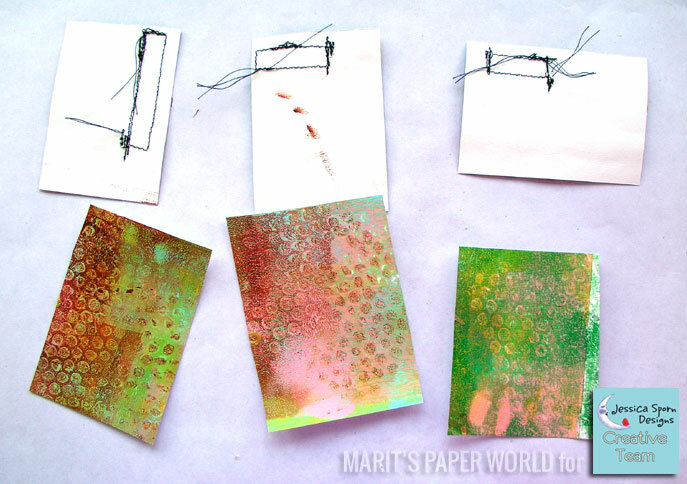 When I gelli-print, I always make some background papers to use later. These are rather simple prints, just some different colored paint rolled onto the gelli-plate and printed on thick watercolor paper. 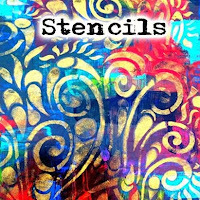 Next, I combine stencils with prints - I choose stencils that match (in my opinion) with the colors on the backgrounds. 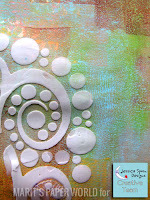 I want to add some dimension so I use modeling paste to scrape through the parts of the stencils that I like to use. 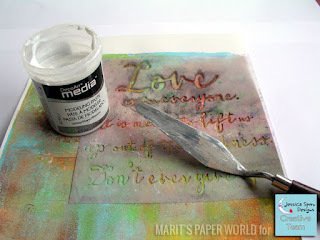 See how I use just parts of the stencils? These parts of my paper will turn into ATCs (2.5 x 3.5 inch) so I don't need the full image design. 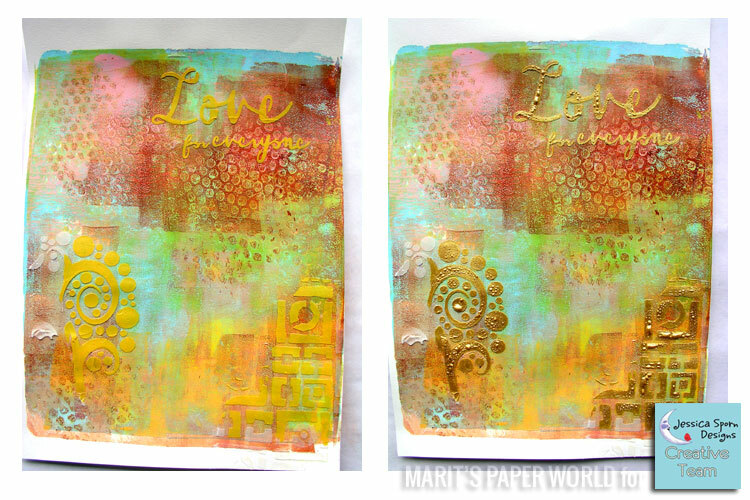 Also, I might want to use part of the background paper as is to glue on the back of my ATCs so I leave some spots untouched. Let the modeling paste dry completely overnight. The modeling paste adds some dimension and gives depth to the image, here's a detail. Now, I don't know exactly how to go on... shall I paint the images? What would it look like if I ink them? I try several different techniques to see what each looks like so I can pick the ones I like best. 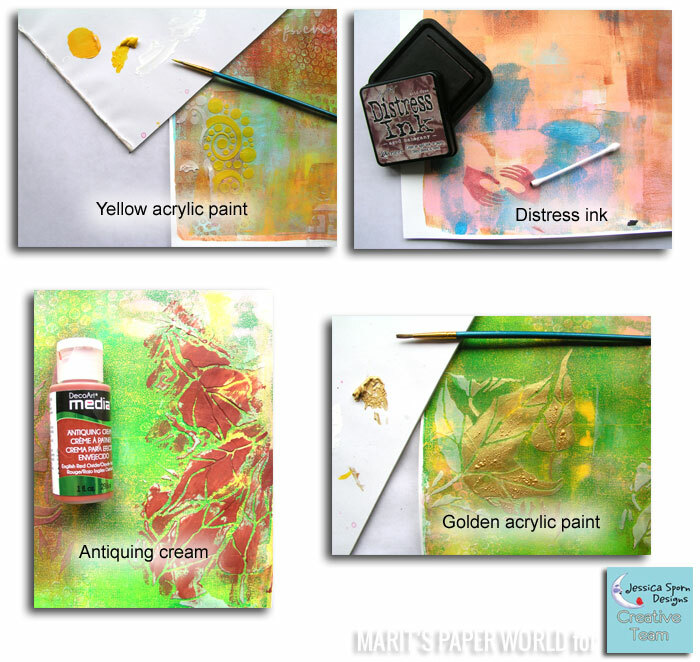 On one page, I paint the stenciled images with yellow acrylic paint. I kinda like it, but the yellow against the background doesn't show much contrast. On another image I add distress ink with a Q-tip. Hmmm... too fuzzy looking. Antiquing creme then... I put it on the stenciled image and take it off again right away... it looks awful! 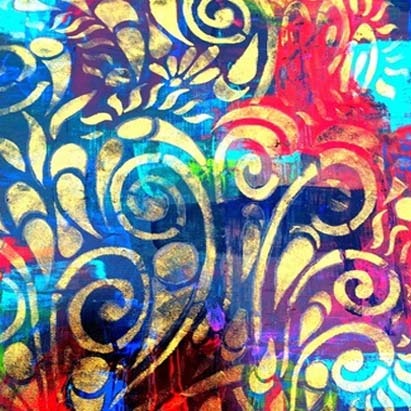 I then grab my golden acrylic paint... 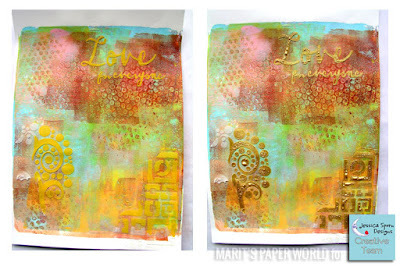 I love how it bubbles when you dry the paint with a heat tool - I used that technique quite a lot in the past and I use it now on the stenciled image. Wowzah, that's it! And now here's a trick: I cut a frame in the size of an ATC (2.5 x 3.5 inch.) Using a frame like this really is a simple but effective way to 'find' you ATC on a background (or find a nice detail in a photo from a magazine for example.) 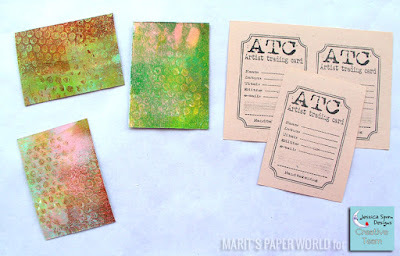 I find three ATC cards on the one piece of paper background. 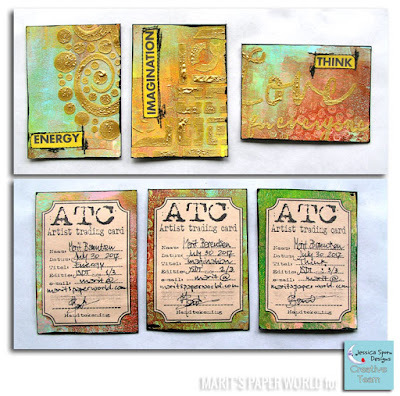 The ATCs 'need' something extra... some contrast? I flip through my magazines and find some fitting words in an advertisement. The colors (black on yellow) add some contrast to my cards. I'm not satisfied still, so I get out my sewing machine and sew around the words. Yep, that's it! 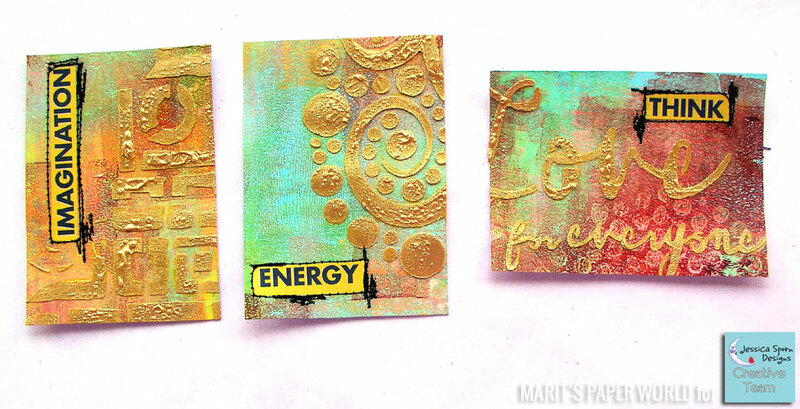 Here's the back of my ATCs. To cover the stitches and the smears I cut out three pieces from the left over paper and glue them on the back. ATCs are always signed and dated on the back. 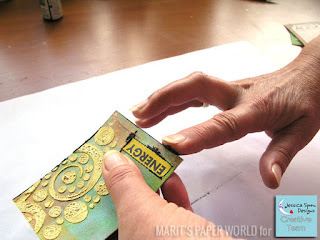 You can of course use a marker and write the info or type, print and cut out strips with your info that you glue on the back. 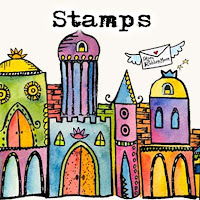 I myself bought an 'ATC stamp' years ago and use it ever since. 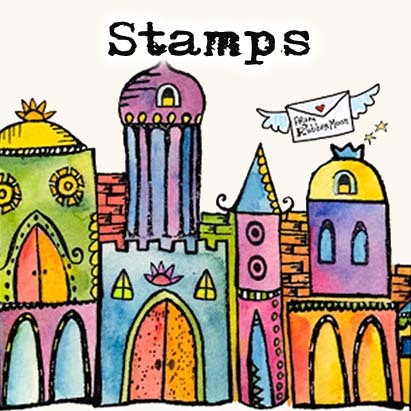 There are all kinds of ATC stamps for sale and if you make ATCs often, it might be worth buying (or making) one. I just love the different ways I can use it. In this case, I stamp it on a pink-ish piece of paper that I cut out and glue on the back. I'm not done yet... the white edges of the ATCs show that the card is made of two pieces glued together. You know how that looks like, don't you? To give the ATCs a finished look, I smear some black paint (DecoArt fluid acrylics, Carbon black) around the edges, using my finger. And now my little ATC series is all done... here's the front ánd the back. 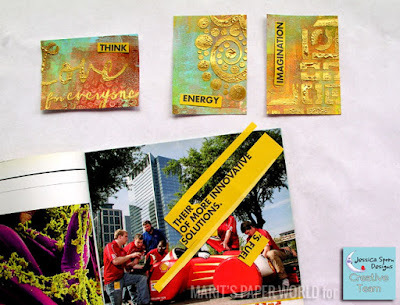 And with this tutorial my term as a member of the Jessica Sporn Design Team comes to an end. When I applied for the DT - in April 2016 - it was with ulterior motives. 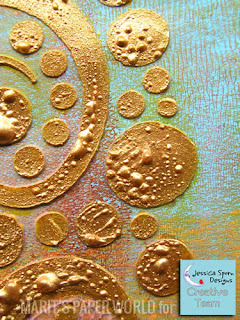 Not only did I admire Jessica's art and did it seem awesome to be able to work with her designed stencils and stamps, I also could do with a bit of consistency... with illness in the family and looking at surgical procedures coming up (my mum, my beloved) I faced an insecure year and had no idea what the months ahead would bring. 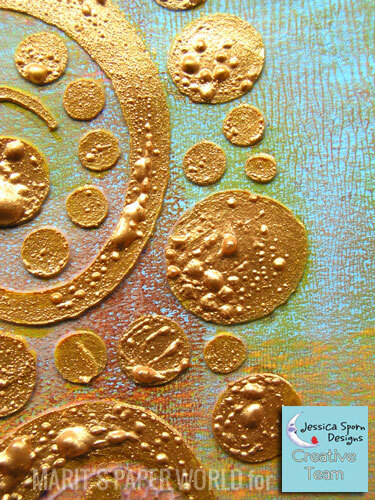 I thought it would help me 'come through' when I would be a member of Jessica's Design Team so that I could keep on making art on a regular base without laying too much pressure on myself. 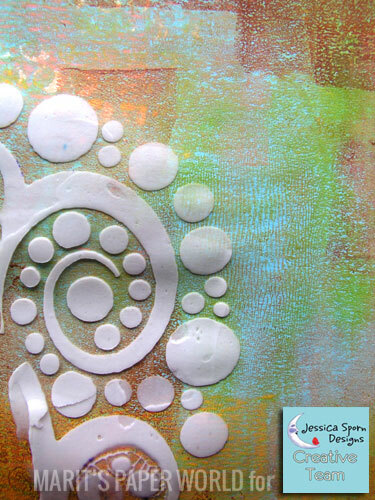 I am ever so grateful that Jessica accepted my submission and brought me into her Design Team. Thank you so much dear, it was exactly what I needed! Now, a year later, everyone is healthy and happy again and it's time for me to move on and dive deeper into my own art again. 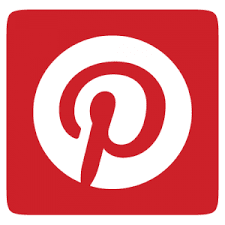 It was a pleasure to create these tutorials for you! Oh Marit, your post makes me happier than ever that you joined there creative team. 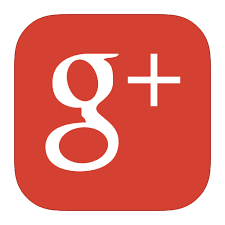 All of your posts have been amazing and this is no exception. I love that you showed your entire process here, even the ones you saved for another day. Stunners all. Hugs to you always.